Background: The superior mesenteric artery (SMA) supplies the greatest volume of blood to the small intestine. The use of Doppler ultrasound to measure SMA blood flow velocity (BFV) is increasingly used to investigate intestinal hemodynamics in neonates. Aim: The aim of this study was designed to correlate Doppler indices of splanchnic perfusion and vascular resistance to early tolerance of feeding and development of necrotizing enterocolitis in preterm (PT) infants. Setting and Design: This study was conducted at the Neonatal Intensive Care Unit, Ain Shams University Hospital, Cairo Governorate, Egypt. Subjects and Methods: Complete Prenatal, natal, and postnatal history were taken; blood culture and complete blood count, C-reactive protein with titer, and assessment of BFA in SMA at day (D) 1 and D7 of life, including peak systolic velocity (PSV), end diastolic velocity (EDV), resistance index (RI), and pulsatility index (PI), were done upon enrollment of 65 neonates who subdivided into either PT groups, hypoxic-ischemic encephalopathy group, or full-term group. Results: There was a significant difference between the three groups regarding PSV, EDV, and RI before and after feeding. As for the qualitative data of the Doppler indices of SMA, there was a statistically significant difference between the three groups as regards the PI in D1 (P = 0.022), PSV in D7 (P = 0.018), and EDV in D7 (P = 0.040); however, there was no significant difference between the three groups as regard PSV in D1, EDV in D1, RI in D1 and D7, and PI in D7. Conclusion: Doppler hemodynamic studies of SMA in PT infants showed that change in RI parameter in response to small enteral feeds proved to have a highly significant difference with the dependent variable (feeding tolerance) which might be a good tool for the clinician in predicting early tolerance to enteral feeding. Providing adequate nutrition is a key component of the healthcare of preterm (PT) neonates. There is an increasing emphasis on early initiation and appropriate advancement of enteral feeds with the aim of achieving full volume at the earliest opportunity. Feeding intolerance is a common problem in PT infants. It causes frequent interruption and delayed advancement of enteral feeds resulting in protracted use of total parenteral nutrition and central venous lines, increasing their complications rate. Delay in establishing full enteral feeds is a significant contributor to growth failure in PT infants, resulting in neurodevelopmental impairment and long-term metabolic complications. The dependence of intestinal blood flow on a single vessel superior mesenteric artery (SMA) implies that changes in SMA blood flow patterns may have significant physiological and pathological effects on the bowel. Duplex-pulsed Doppler ultrasound provides a safe, noninvasive, and bedside technique to assess the hemodynamics of SMA so might provide a clue in investigating the maturation of intestinal circulation in PT infants. This study was designed to correlate Doppler indices of splanchnic perfusion and vascular resistance to early tolerance of feeding and to establish whether serial duplex study of the SMA in early days of life could predict the development of necrotizing enterocolitis (NEC) in PT infants. This was a prospective blinded study, carried out at the neonatal intensive care unit (NICU) of Obstetrics and Gynecology Department, Ain Shams University Hospital. The informed consent was obtained from the parents of each enrolled infant. The study group consisted of 65 neonates (29 males and 36 females) who divided into three groups as follows: Group I included 25 healthy PT infants ≤36 weeks of gestation; after uncomplicated pregnancies, Group II included 15 PT infants with hypoxic-ischemic encephalopathy (HIE); and Group III (control) included 25 healthy full-term (FT) infants ≥37 weeks of gestation. All the conditions which could alter superior mesenteric blood flow velocity were eliminated as phototherapy, ventilator support, various pharmacological agents, and umbilical artery catheterization. If umbilical artery catheter was previously inserted, it was removed at least 12 h before test fed. We excluded from the study all newborns with malformations, gastrointestinal abnormalities, early-onset sepsis before initiation of the study, anemia, venous hemoglobin (Hb) <10 g/dl, polycythemia, venous Hb >22 g/dl, platelet count <5000/mm3, patent ductus arteriosus echo, hypotension or hypertension, intraventricular hemorrhage, skin temperature <36°C, hypoglycemia (<47 g/dl), and administration of vasoactive drugs other than caffeine and all mothers had received betamethasone. All studied newborns were subjected to detailed history (birth weight, evaluation of Apgar score at 1, 5, and 10 min, and determination of cause of prematurity). Full physical examination including gestational age using modified Ballard score. All studied newborns were treated according to the NICU standard clinical care guidelines. Initiation of feeding of all infants in this study was based on clinical decision provided by the nursery staffs that were blinded about the results of the Doppler study. Medications, ventilation, ventilator settings, and volume of fluid administered were not altered for the study purposes. The rate of progression of the volume of feeds was determined based on the following criteria: adequate body weight gain, maintenance of thermal stability, and absence of exacerbations of feeding intolerance and/or abnormal medical conditions (e.g., increased apnea or oxygen need). The test feed consists of 2 ml formula or breast milk (when available) delivered by gravity through a nasogastric tube, and then feeding was gradually increased by 20 ml/kg/day if tolerated by the infants (using breast milk or the same formula milk) until a volume of 150 cc/kg/day was reached. These feds were given at 3-h interval. During this period, the babies were examined for abdominal distension, gastric residue before each feeding regarding the color and volume, and besides general examination including activity, cardiovascular, and respiratory functions. Feeding intolerance was diagnosed, and accordingly, oral feeding stopped with one or more of the following criteria: increased gastric aspirate volume or bile-stained aspirate, abdominal distension, apnea, or bradycardia. The duration (in days) from test feed to full enteral feeding was estimated for each neonate. The duration in this study ranged from 4 to 36 days with median of 7 days. Accordingly, neonates were redivided into two groups as follows: early tolerance (T) group (Group E) those neonates who achieved full enteral intake within 7 days, it included 15 PTs, 19 FTs, and 7 hypoxic PT neonates, late T group (Group L). 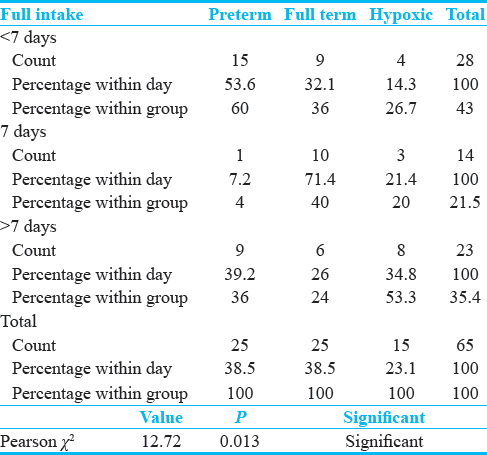 Those neonates who achieved full enteral intake after 7 days, it included ten PTs, six FTs, and eight hypoxic PT neonates. A LOGIQ 400 proseries (General Electric) duplex-pulsed Doppler ultrasound machine with a 5 MHz short focus probe and high pass filter at 50 HZ was used for imaging the SMA at its origin from the abdominal aorta. The transducer was placed on the mid-abdomen just below xiphisternum in the sagittal plane while the neonates were in the supine position inside the incubator. Color flow mapping was used to identify the SMA where it originated from the aorta. The sample volume of the pulsed Doppler was placed a few millimeters distal to the origin of SMA, as the diameter of the vessel at this point changes minimally after feeding; hence, BFA will provide a true representation of blood flow. An angle correction of ≤30°C was used when necessary. Each Doppler recording was saved to stereo videotape for subsequent analysis. For each neonate, in the study, when the clinician decided to start enteral feeding the baby was studied 15 min preprandial, then test feed was given through a nasogastric tube then reevaluated 60 min postprandial on the 1st day of initiation of enteral feeding and on day (D) 7. In all neonates, we studied the following parameters after obtaining five consecutive waveforms: peak systolic velocity (PSV), end-diastolic velocity (EDV), and resistance index (RI) (Pourcelot ratio): RI = (PSV − EDV)/(PSV), pulsatility index (PI) (impedance index): PI = (PSV − EDV)/(MV). All the measurements were performed by one investigator blinded to the group assignment of the infants to avoid interobserver variability. Statistical comparison was made using program SPSS version 12 (SPSS Inc., Chicago, Illinois, USA) either descriptive statistics using mean and standard deviation or analytical statistics. Using the ANOVA, the Student's t-test for quantitative analysis of parametric data, Mann–Whitney test for quantitative analysis of nonparametric data, Chi-square test for qualitative analysis, Spearman correlation test for correlation of Doppler parameters with feed tolerance, and Multiregression analysis for Doppler parameters with tolerance of feeding. 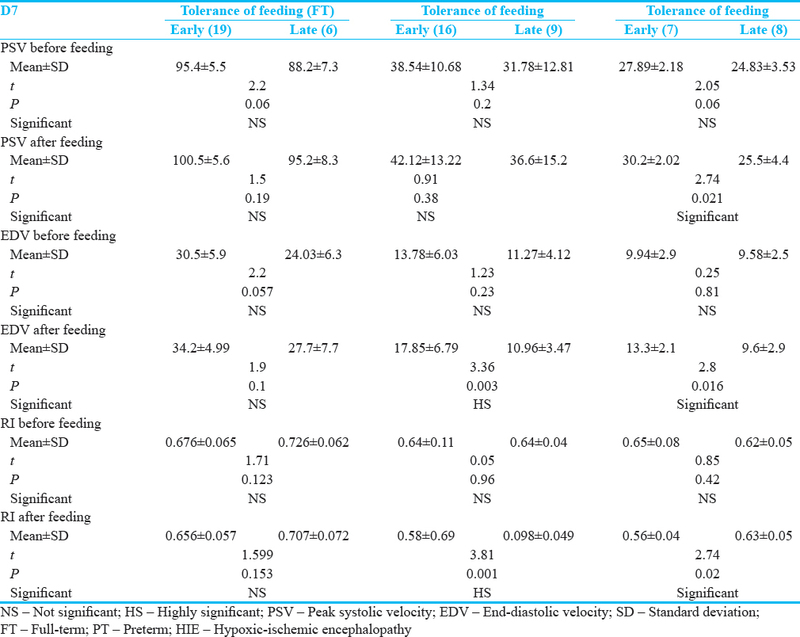 Statistical comparison between the three groups showed that they were significantly different regarding the duration taken to reach full enteral intake, P = 0.013 (36% of PT, 24% of FT, and 53.3% of HIE) reached full enteral feeding within more than 7 days [Table 1] and [Figure 1]. For the FT group, there were no statistically significant differences regarding the pre and postprandial Doppler indices between early T group (19 infants) and late T group (six infants) at both D1 and D7, while for the PT group, there was highly significant decrease in EDV postprandial both on D1 and D7 among late T group in comparison to early T group. Furthermore, there is highly significant increase in RI postprandial among late T group both on D1 and D7 (P = 0.003, P = 0.001, respectively) [Table 2] and [Table 3]. Whereas for the hypoxic group, only the preprandial RI in D1 (P = 0.01) and the postprandial PSV (P = 0.021), EDV (P = 0.016), and RI (P = 0.02) in D7 show a statistically significant difference between infant who had early tolerance of feeding (seven infants) and those infants who had late tolerance of feeding (eight infants) while the other Doppler indices show no significant difference [Table 2] and [Table 3]. This was in agreement with Papacci et al., who studied the different Doppler indices (PSV, EDV, RI, and PI) in FT neonates and different gestational ages of PT but not the hypoxic neonates without demonstrating their impact on tolerance to enteral feeding with minimal nonstatistical differences. When comparing the two groups regarding the qualitative data of the Doppler indices, we found that there was a significant difference between Group E and L as regards EDV and RI in D1 (P = 0.000) and D7 (P = 0.003, P = 0.000, respectively), while there were no significant differences as regard PSV and PI in D1 and D7 [Table 4]. EDV increased in 92.7% among early T group whereas it increased among only 45.8% of late T group on D1. Regarding RI values on D1, it decreased in 95.1% among early T group whereas it decreased in only 29.2% of late T group. Very near results were detected on D7. This agreed with Fang et al., who described that early tolerance to enteral feeds correlated significantly (P < 0.00l) with a lower index of vascular resistance at 60 min after the test feed. Using ANOVA test to analyze the descriptive data of the Doppler indices of SMA obtained from our studied groups. The study showed a highly significant difference between the three groups regarding PSV, EDV, and RI before and after feeding (significant higher values among FT in comparison to other two groups) (P = 0.000); however, there was no significant difference between them as regard PI before and after feeding in both D1 and D7. This was in agreement with Leidig, Gladman et al., Coombs et al., and Fang et al., who concluded that the first exposure of neonates to a small volume of milk feed is associated with postprandial changes in BFA consistent with an increase in blood flow in the SMA; however, they did not comment on PI and RI values. 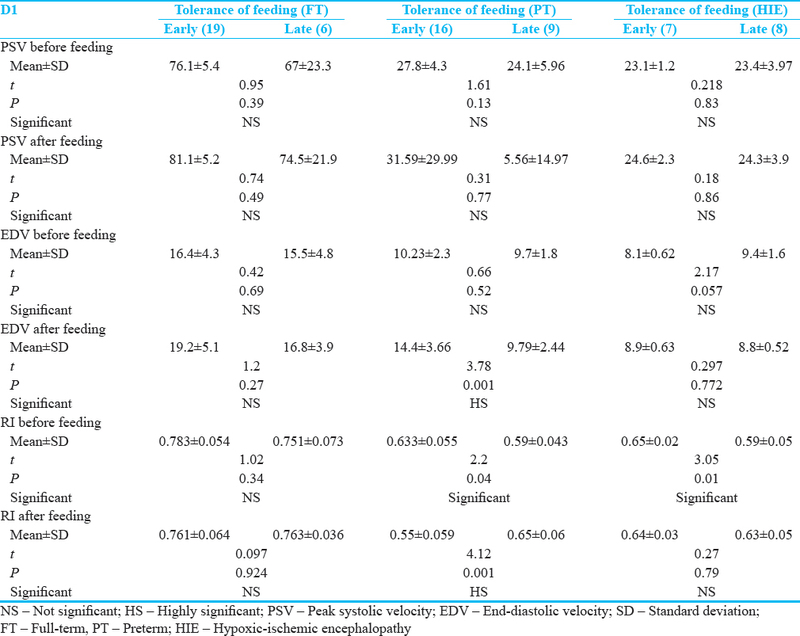 In our study, when comparing the development of NEC and the Doppler indices, we found that significant lower value of EDV with feed at both D1 (P = 0.004), D7 (P = 0.002) among NEC positive cases more than NEC negative cases. Furthermore, there was a significant higher value of RI with feed at both D1 (P = 0.001) and D7 (P = 0.000) among NEC positive cases more than NEC negative cases [Figure 2] and [Figure 3]. This was in agreement with Fang et al., who suggested that enteral nutrition may even be harmful causing serious complications as nonocclusive bowel necrosis. There is a risk of increasing splanchnic metabolic demands with the enteral delivery of nutrients in critically ill patients. This may explain neonatal intolerance to enteral feeding and death in 8 of our 9 critically ill neonates who showed a postprandial drop of SMA blood flow as detected by a trend of rise of RI [Figure 4], [Figure 5], [Figure 6]. It is possible that the physiological changes in these unwell infants affect the motility and release of vasoactive substances, or the effect of the release of cytokines and inflammatory mediators may influence the response of SMABFA to the first test feed as explained by Fang et al. Jacob highlighted that in these conditions, splanchnic perfusion may be compromised, and feeding that increases intestinal metabolic demand poses a theoretical risk of intestinal ischemia. Using the multi-regression analysis of the Doppler ultrasound indices as a tool to know which Doppler index is the most important in predicting early tolerance of enteral feeding for both the PT and the hypoxic groups, we concluded from those results that the change in the RI is the most important parameter of the Doppler indices in predicting early tolerance to enteral feeding in both PT and hypoxic groups and that we can depend on it as early as D1 of starting feeding. Early feeders showed an adequate hemodynamic response as demonstrated by a significant rise of EDV and a significant drop of RI postprandial, while late feeders showed a poor hemodynamic response as demonstrated by a significant drop of EDV and a significant rise of RI postprandial especially in D1. PT infants are commonly exposed to endogenous and exogenous factors that might influence postprandial hemodynamic adaptation. Among factors that affect splanchnic blood flow patterns are postnatal age, perinatal asphyxia, receiving different types of drugs, and sepsis. Using the duplex-pulsed Doppler ultrasound of the SMA in PT infants, the change in resistive index parameter in response to small enteral feeds proved to have a highly significant difference with the dependent variable (feeding tolerance) in both D1 and D7 which might be a good tool for the clinician in predicting early tolerance to enteral feeding. Stevens TP, Shields E, Campbell D, Combs A, Horgan M, La Gamma EF, et al. Variation in enteral feeding practices and growth outcomes among very premature infants: A report from the New York State perinatal quality collaborative. Am J Perinatol 2016;33:9-19. Kaur A, Kler N, Saluja S, Modi M, Soni A, Thakur A, et al. Abdominal circumference or gastric residual volume as measure of feed intolerance in VLBW infants. J Pediatr Gastroenterol Nutr 2015;60:259-63. Embleton ND. Early nutrition and later outcomes in preterm infants. World Rev Nutr Diet 2013;106:26-32. Robel-Tillig E, Knupfer M, Pulzer F, Vogtmann C. Blood flow parameters of the superior mesenteric artery as an early predictor of intestinal dysmotility in preterm infants. Pediatr Radiol 2004;34:958-62. Pezzati M, Dani C, Tronchin M, Filippi L, Rossi S, Rubaltelle FF. Prediction of early tolerance to enteral feeding by measurement of superior mesenteric artery blood flow velocity: Appropriate-versus small-for-gestational-age preterm infants. Acta Paediatr 2004;93:797-802. Ballard JL, Khoury JC, Wedig K, Wang L, Eilers-Walsman BL, Lipp R. New Ballard score, expanded to include extremely premature infants. J Pediatr 1991;119:417. Lane AJ, Coombs RC, Evans DH, Levin RJ. Effect of feed interval and feed type on splanchnic hemodynamic. Arch Dis Child Fetal Neonatal Ed 1998;79:F49-53. Papacci P, Giannantonio C, Cota F, Latella C, Semeraro CM, Fioretti M, et al. 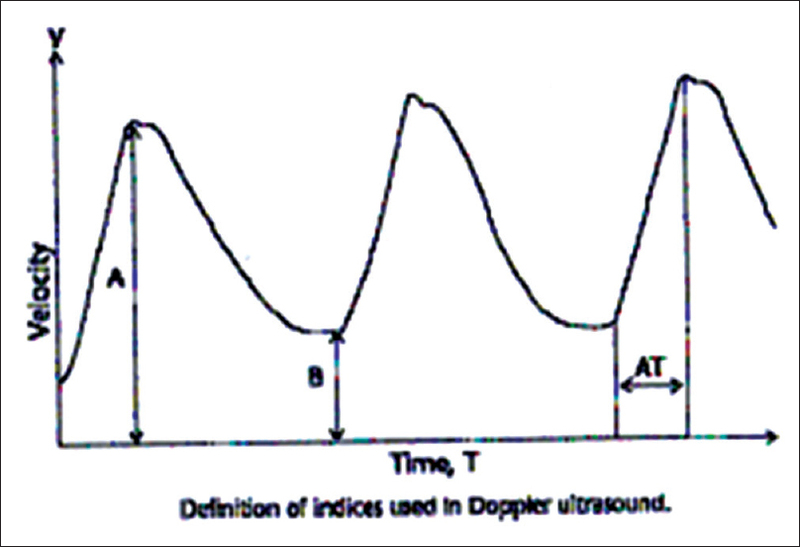 Neonatal colour Doppler ultrasound. Pediat Radiol 2009;39:328-35. Fang S, Kempley ST, Gamsu HR. Prediction of early tolerance to enteral feeding in preterm infants by measurement of superior mesenteric artery blood flow velocity. Arch Dis Child Fetal Neonatal Ed 2001;85:F42-5. Leidig E. Doppler analysis of superior mesenteric artery blood flow in preterm infants. Arch Dis Child 1989;64:476-80. Gladman G, Sims DG, Chiswick ML. Gastrointestinal blood flow velocity after the first feed. Arch Dis Child 1991;66:17-20. Coombs RC, Morgan E, Durbin GM. Gut blood flow velocities in the newborn: Effects of a patent ductus arteriosus and parenteral indomethacin. Arch Dis Child 1992;65:1067-71. Rokyta R, Matejovic M, Krouzecky A, Senft V, Trefil L, Novak I. Post-pyloric enteral nutrition in septic patients: Effects on hepato-splanchnic hemodynamics and energy status. 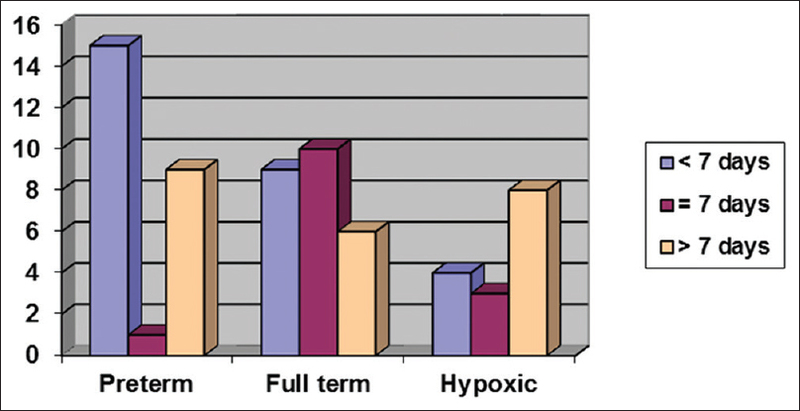 Intensive Care Med 2004;30:714-7. Jacob SM. Splanchnic blood flow in low-flow states. Anesth Analg 2003;96:1129-38.